WILLEMSTAD - The mosquito plague in Riffort in Otrabanda comes from illegal dumping of waste in the mangrove area of the Rif. This is according to the health department (GGD). The department is doing all that is in its power to eliminate the mosquito problem. Especially the Saint Elizabeth hospital is suffering from the plague. The whole water drainage system is clogged because of the dumping of waste. The Public Works department is now working to resolve this problem and the GGD has started spraying. The GGD is also investigating who is responsible for the illegal dumping of waste in that area. 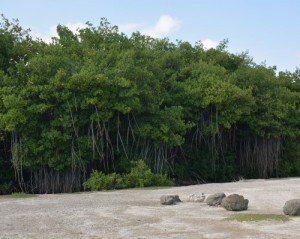 Especially since the mangrove area is a protected natural habitat for fish.